A tropical island paradise nestled in the waters surrounding Indonesia, Bali is a popular destination for those looking to bask in glorious sunshine as well as for those more intrepid explorers who are in search of adventure. If you are planning your first trip to this magical island, read on to discover the best places to stay and the best things to do in Bali on your holiday. As a volcanic island surrounded by a series of smaller islets, Bali offers a wide range of activities and excursions. There’s scope to enjoy cultural, sporting and adventurous pursuits, as well as some glorious opportunities to soak up the sun and revel in the beautiful scenery. This is a truly incredible place that all but guarantees an unforgettable holiday no matter where you choose to stay but certainly learning about the options of where to stay and what to do in Bali before you visit, will help you make the most of your time in paradise. Bali has an extensive collection of resorts and locations, each of which offer something different. From the cultural gem of Sanur and the lively beaches of Kuta and Seminyak to tranquil Lombok and the stunning inland gem of Ubud, Bali provides an array of holiday experiences. Here’s an insight into the best places to stay in Bali. Sanur is one of the island’s original tourist resorts and it has a charming, rustic, small-town vibe. Located in the south east of the island, visitors are confronted with a sprawling golden sand beach in addition to an impressive collection of artisan shops and stores that are bound to turn the heads of anyone hoping to stock up on unique mementos to take home. 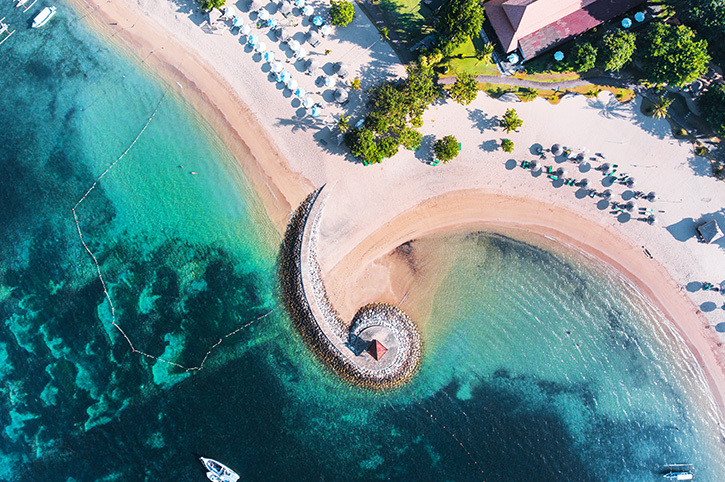 Sanur is big enough to keep tourists occupied, but it’s not as glitzy and glamorous as some of the major resorts on the west side of Bali. For many, this is the Goldilocks of the island’s destinations, with just the right blend of energy and tranquillity. There are a host of accommodation options, from luxury hotels to affordable guesthouses on offer, so there’s choice aplenty and something for everyone. Kuta is arguably Bali’s most famous beach resort. Seized upon by developers who wanted to bring this morsel of perfection to the global traveller, Kuta has grown significantly over the years, but has managed to retain much of its beauty. The famous beach is ideal for those who enjoy swimming and snorkelling. It’s also possible to spot turtles slowly making their way through the sand here. Away from the peaceful waters, the centre of Kuta is a different proposition altogether and this is the place to be for those keen to enjoy a drink, meet fellow travellers and raise a glass to a good time. There’s an assortment of guesthouses, hostels and beachfront suites on offer for those keen to book a fantastic Bali hotel. Seminyak is Bali’s most exclusive tourist spot, packed with luxury apartments, opulent hotels and designer boutiques as well as impossibly cool beach clubs, bars and restaurants. If taking a break is all about watching the sunset, a tropical cocktail in hand with swaying palm trees and soothing background music for company, Seminyak is an ideal holiday destination. Lombok is Bali’s next door neighbour and it provides a beautiful setting for a restful break. Less developed and less hectic than many of Bali’s most high-profile resorts, Lombok is a place to chill out, kick back and embrace the serenity. Lombok is an emerging tourist destination and as such it has a more limited range of accommodation options. Nevertheless, it’s not difficult to find Lombok hotels that appeal to all kinds of travellers with varied budgets. After experiencing the glistening azure waters and pristine sands of Bali’s coastline, there’s no better place to go than the inland idyll of Ubud. Ubud represents an entirely different image of Bali and it is a verdant jewel that will provide memories to last a lifetime. The scenery is staggering but this is also a cultural hub, coming alive with the sound of music and the rhythms of traditional Balinese dance. It is located on the uplands in the centre of the island, with geography characterised by vibrant rice paddies and dense tropical rainforest. For an authentic Bali experience, choose an Ubud hotel with wonderful outdoor spaces. Bali is a diverse island, which offers everything from cultural activities and shopping to water sports and animal encounters. It’s very easy to create a packed itinerary, which showcases the breadth of excursions on offer and treats visitors to a scintillating snapshot of this spectacular island. Whatever your interests, one thing is clear. There’s no shortage of things to do in Bali. Nestled in the forests and meadows that make up Bali’s countryside, visitors will find a collection of awe-inspiring temples, including the Royal Temple at Mengwi and Tanah Lot. The Royal Temple has long been linked to the Balinese royal family and is still used to celebrate special occasions and host ceremonial events. Characterised by ornate spires, the temple is a sight to behold, but it also has an ethereal quality, which induces a state of calm and relaxation. En route to the sea temple of Tanah Lot, visitors will journey through the forests of Alas Kedaton, which are home to hundreds of energetic macaque monkeys. On arriving at Tanah Lot, it’s easy to see why this temple complex has such an influential role in Balinese history and mythology. Isolated from the shore when the tide is high, this unique outcrop forms part of a band of seven temples that surround the island. This is an outstanding view at any time but there’s something incredibly magical about sunset at this spot. Book your Mengwi & Tanah Lot Day Tour today. The turtle release day tour is a must for animal lovers. This trip takes in the macaque-filled forests of Alas Kedaton before taking visitors to the Pan Pacific resort on the south coast. The Pan Pacific has established a programme designed to protect the island’s turtle population, encouraging tourists to take an interest in conservation and to get involved with projects that are in place on the island. This initiative gives visitors the chance to adopt baby turtles, give them a name and then watch them being released into the open waters. The conservation project aims to protect baby turtles and provide them with the space and safe havens they need to return to the beaches and lay eggs in the future. Discover more about our Turtle Release Day Tour now. Anyone who dreams of toasting their holiday aboard a boat while the sun sets and the sky turns into a beautiful melange of pinks, reds and oranges will find their bliss when setting sail in Benoa Harbour! This sunset cruise is a wonderfully sedate voyage, which treats visitors to breathtaking views of the sun setting over the island and the ocean waves, as well as refreshments, a gourmet buffet feast and live music. What better way to round off another day in paradise? Find out more about our Bali Sunset Cruise today. Ubud is the cultural heartbeat of Bali, providing a wealth of fascinating excursions for tourists keen to explore the inland territories and learn more about Balinese music, art, crafts and dance. This cultural extravaganza takes in everything from museums to markets and is a brilliant way to see a different side of Bali. The first stop is Neka Art Museum, which houses a collection of paintings and pictures that are inspired by local landscapes and the natural beauty of the island. 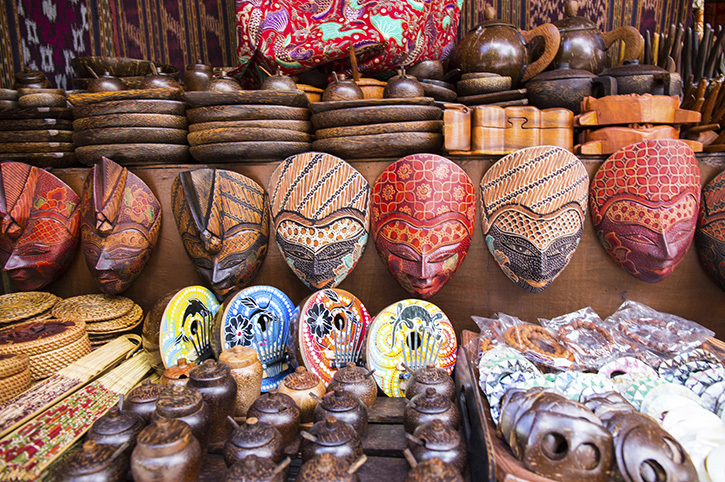 The next port of call is the captivating centre of Ubud, where it’s possible to meander through the markets and cast an eye upon artisan crafts, decorative ornaments, brightly-coloured fabrics, jewellery and bags. After haggling for a bargain and packing bags full of souvenirs, it’s time to head to Ubud Palace, the home of the local royal family. Away from the nobility of the region, this area is also surrounded by quaint villages which are bursting with workshops and craft stores: it’s well worth taking time to explore here, enjoy classes in traditional Balinese cooking and browse galleries and shops. Book your Ubud Arts & Culture Day Tour now. The Lombok Explorer tour offers a magnificent opportunity to enjoy an island hopping adventure, taking in Bali, Lombok and the Gili Islands. You’ll take a short, 20-minute scenic flight and touch down on the secluded island of Lombok before discovering the pristine beaches, the bright ocean waters and the beautiful rugged mountain backdrops that frame the bays in this special area of the world. 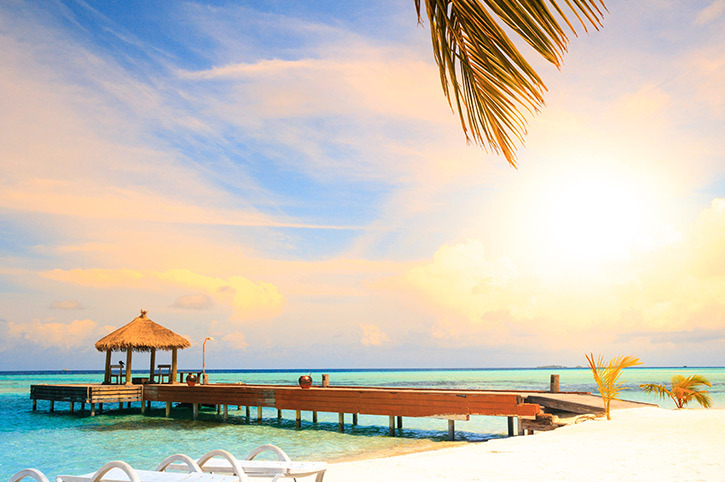 The shoreline is an idyllic base for topping up your tan, swimming and snorkelling, and visitors can also see turtles plodding leisurely along the beaches. Inland, however, is where your cultural tour awaits. Take the chance to visit shops and observe traditional crafting processes and techniques in action. After falling head over heels in love with Lombok, visitors will make for the crystal clear waters that surround the Gili Islands. This is a haven for marine life, boasting an absurd abundance of vividly-coloured tropical fish. The islands comprise three masses, the largest of which is Trawangan. On terra firma, the best way to explore the island is to rent a bike and travel around on two wheels taking things at your own leisure. Discover more exciting things to do in Bali for your holiday. 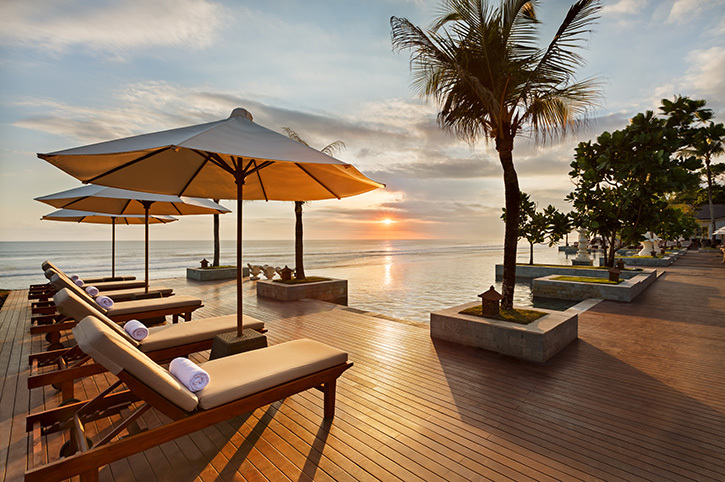 Bali is an increasingly popular holiday destination and it’s no wonder. An island base that offers everything from sun-scorched beaches and bright blue waters to lush rice paddies, rainforests and picturesque villages, Bali has something to offer every holidaymaker. There’s a vast range of accommodation options to suit all budgets and a dazzling selection of excursions and adventures to thrill you and your family. From languid sunset cruises, island hopping itineraries and wildlife encounters to cooking classes, market tours and unforgettable trips to temples and palaces, Bali is a truly beguiling holiday destination. Discover our top Bali holidays now.